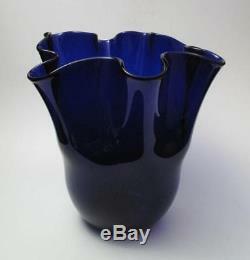 VINTAGE ITALIAN MURANO VIBRANT COBALT BLUE ART GLASS VASE MID CENTURY EAMES ERA. EXQUISITE VINTAGE ITALIAN MURANO FREEFORM ART GLASS VASE. Presenting an impressive vintage Italian Murano art glass vase. Which has been expertly hand crafted by a master Italian glass artist circa 1960s. This highly appealing piece has a lovely tall, sleek, freeform shape and an exquisite vibrant cobalt blue colour. The intensity of the radiant cobalt blue coloured glass is truly magnificent. This striking piece looks truly stunning with light illuminating the intense blue colour. This exquisite Murano art glass vase has been masterfully tooled to create an organically waved top rim with thick folds and curves of glass formed between. The rich cobalt blue colour radiates with a magnificent intensity as it reflects off the stylish curves. This magnificent piece looks sensation with light passing through the glass, spectacularly intensifying the rich blue colour and casting divine vibrant reflections. Wonderfully sculptural vintage work of art would make an impressive feature in any retro, modernist or eames styled decor! This fabulous Italian Murano art glass piece is presented in excellent vintage condition with no chips, cracks or repairs. This stunning piece has been exceptionally well cared for and presents spectacularly. This impressive art glass vase stands approx 210mms tall and measures 210mms in width. This substantial vintage piece weighs approx 1.145kg unpacked. This piece has been very well finished with a quality flat ground polished base with sufficient light surface scratches to authenticate this is a genuinely vintage example. This exquisite piece would make a fine addition to any vintage Murano art glass collection and a sensational feature in any retro, modernist, eames era or traditionally styled home! A perfect gift idea for the discerning admirer of fine quality, hand crafted, artistically designed vintage objects of sheer beauty! International buyers are most welcome. Sorry, no personal cheques accepted. All items are professionally packaged using quality materials. We individually hand select quality vintage, antique, well designed and hand crafted pre-loved items, and proudly offer our finds for sale. We aim to describe and visually represent our items as accurately as possible. Get Supersized Images & Free Image Hosting. Auctiva's Listing Templates improve your auctions in minutes. Attention Sellers - Get Templates Image Hosting, Scheduling at Auctiva. The item "VINTAGE ITALIAN MURANO VIBRANT COBALT BLUE ART GLASS VASE MID CENTURY EAMES ERA" is in sale since Monday, August 21, 2017. This item is in the category "Pottery, Glass\Glass\Art Glass\Italian".